One in five Americans are using a tobacco product, primarily cigarettes, cigars, or pipes, according to a new report by the U.S. Centers for Disease Control and Prevention (CDC) and the Food and Drug Administration (FDA). There has been much progress over the past 50 years as the overall cigarette smoking rate nationwide has dropped from more than 50 percent during the 1960s to 15 percent currently. But e-cigarettes, or “vaping,” are helping draw teens and young adults to smoking, and more people are trying newer tobacco products. These are trends that concern healthcare professionals. About 42 million adults – more than 87 percent of the nation’s nearly 49 million tobacco users – have reported using a combustible product such as cigarettes, cigars, or pipes (including hookahs and water pipes), according to the new data from the CDC and FDA. The remaining 13 percent of adult tobacco users report using e-cigarettes or smokeless tobacco products, such as chewing tobacco and dissolvable tobacco (which dissolves in the mouth), the agencies report. Today, November 16, marks the American Cancer Society’s 42nd annual “Great American Smokeout,” which is held on the third Thursday of November each year. The goal of the event to encourage more smokers to quit, even if it’s just for one day. Quitting is an uphill battle for many people who have been addicted for years to nicotine and other chemicals found in most tobacco products, says Juan Carlos Batlle, M.D., chief of thoracic imaging at Baptist Health South Florida. Many smokers pick up the habit at a young age, starting in their late teens, he adds. “Unfortunately, cigarettes are addicting, and people end up with this life-long problem,” says Dr. Batlle. Tobacco use remains the single largest preventable cause of disease and premature death in the United States. Smoking causes immediate harm to the body, and increases risks for cancer, heart attack, lung disease, and early death. Smoking represents, by far, the largest risk factor for lung cancer, and smoking is responsible for more than 80 percent of diagnosed cases of the disease. The CDC’s report is based on its first coordinated effort with the FDA to use the annual National Health Interview Survey (NHIS) to collect data on Americans’ use of a variety of tobacco products, instead of just combustible tobacco. Among all adults, cigarettes were the most commonly used product (15.1 percent); followed by e-cigarettes (3.5 percent); cigars, cigarillos, which are small filtered cigars (3.4 percent); smokeless tobacco (2.3 percent); and pipes, water pipes, or hookahs (1.2 percent). 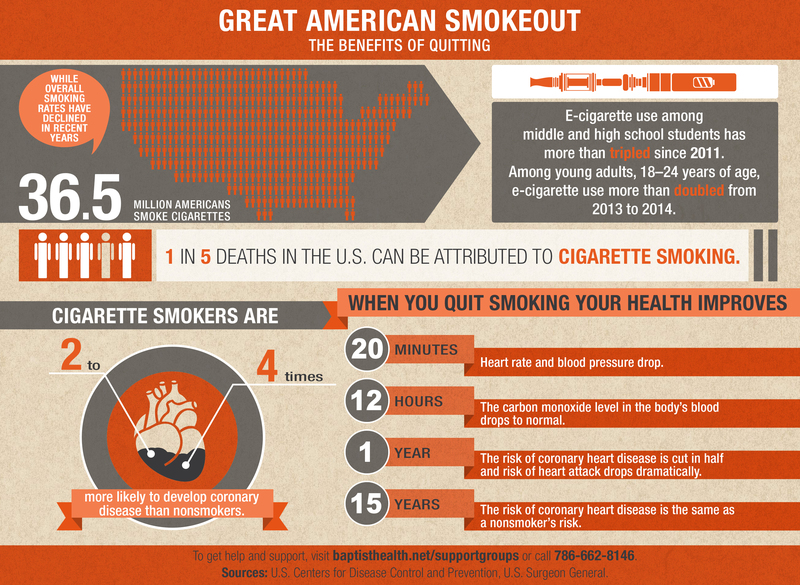 The Great American Smokeout annually reminds smokers about the immediate and longer-term health benefits of quitting the habit. (See infographic below). Infographic by Irina de Souza.